Hoffman, Tucker, Crews, Corry, Totherow Score wins in Opening Night! 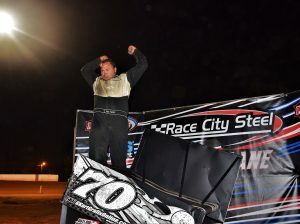 SALISBURY, N.C. – For the second year in a row, Nick Hoffman laid claim to the Wednesday Series season-opener at Millbridge Speedway, winning the headlining 20-lap Open division feature. Nick Tucker (500 Outlaw), Brent Crews (Intermediate), Sam Corry (Box Stock) and Landon Totherow (Beginner Box Stock) were also victorious in their respective classes during the opening week of competition, which was postponed twice due to inclement weather before finally being completed. Hoffman inherited the top spot with nine laps remaining, after polesitter and early leader Clark Houston’s kart stumbled down the backstretch before spinning in turn three with motor issues. The Mooresville, N.C. resident then led the rest of the way, holding off late challenges from both Monster Energy NASCAR Cup Series star Kyle Larson and reigning track champion Carson Kvapil en route to the win. “It’s always pretty cool to come out here and race against these guys, and even cooler when we can pick up a win,” said Hoffman, a three-time UMP Modified champion during Volusia Speedway Park’s annual DIRTcar Nationals. The night’s racing was markedly different than in past years at Millbridge, as the preferred groove for most of the night was right around the inside berm of the sixth-mile dirt oval. However, the one driver who was chasing Hoffman on the final restart was the one he was most worried about. After a debris caution with five to go tightened up the field, Kvapil was able to use a late slide job to steal the runner-up position, with Larson, Andrew Wehrli and Nick O’Dell completing the top five. In other feature racing, Tucker – a former co-owner of Millbridge who hadn’t raced at the track since the summer of 2017 – made his return to the sixth-mile in triumphant fashion by picking up the win in the new 500 Outlaw class. The 15-lap feature, featuring premier class karts with two-stroke motors, saw Tucker lead every lap from the pole. It was shortened after nine caution periods pushed the total running time of the main to more than 20 minutes. That was no bother to Tucker, however, as he pulled away from the field on every restart. Dylan Smith crossed the line as the runner-up, .697 of a second adrift of Tucker and ahead of Wehrli, Sam Platt and Karsyn Elledge. Crews dominated the caution-free Intermediate feature, sliding Eli Adams for the lead on lap nine of 20 and then pulling away to a 1.263-second victory for his third career win in the class at Millbridge. Caden Kvapil, Adams, Bregoli and Collin Scarborough completed the top five. A late restart lifted Sam Corry to victory in the 20-lap Box Stock main event, after he passed Aiden Turner entering turn one with four laps to go and drove off to the victory over Turner, defending champion Trevor Cline, CJ Sweatt and Biscuit Williams. Cassidy Keitt dominated the race, leading the first 16 laps from the pole, but spun out in turn two to draw the final caution flag that set up Corry’s pass for the win. Landon Totherow led all the way for his first-career Millbridge win in the Beginner Box Stock class, holding off Ryan Zima on a one-lap dash in the 15-lap feature. Chase Spaulding, Brody Snyder and Jaxon Merrifield finished third through fifth, respectively.